If Cristiano has been phenomenal, then Leo Messi has been exceptional. The little Argentine also has 13 goals to his name and has been at the center of everything Barcelona have done this season. With Xavi struggling for fitness and for form, the reigning World Player of the Year has taken on more responsibility to start and finish attacking moves. Leo has just scored his 100th goal for Barca, which at 23 years of age is a formidable feat. Of course this season’s first Clasico will be about much more than two players. It will be a clash between two teams who are playing the best collective football on the planet right now. If you have watched Barcelona in the last three years, then you know how they play. Short, quick passes, from side to side, until they find a hole to penetrate. When they do, they are deadly. Invariably it’s Messi, Pedro or David Villa who is at the end of their well crafted moves. Even the former Valencia man has started to find his feet and that has led Barcelona to become even more dangerous. Just ask Almeria. They were thrashed 8-0 at home this past weekend. Real Madrid’s brand of football has been just as effective, if not as spectacular. Jose Mourinho’s priority when he arrived was to create a solid unit who could win on a short-term basis. In the first few matches, Los Blancos struggled to impose themselves on their opponents. They netted only six goals in their first five games. Since then, however, it has been a different story. They have put together a seven-match winning streak in which they have scored a whopping 27 goals. An average of nearly four goals per game. So what game can we expect at the Camp Nou on Monday? I believe we will see an open, entertaining affair, with two teams going right at each other’s throats. The title may not be decided in these 90 minutes, but the unofficial crown of best team in the world will certainly be. And we all know that sometimes, bragging rights are more important than trophies. As the countdown to this contest continues, why not send me your predictions on the score and your thoughts on whether this will be the greatest Clasico of all time? With the defeat posted by Barca this past weekend and an immediate response by Real's 5goals, both teams have set the stage for an epic encounter. Despite Real's form at the moment, Barca will win 2-1 on monday. I am curious to see the Mourinho factor in the Madrid team heading into Clasico. Of course, the Madrid/Barca clash is always a mouth- watering feast showcasing the biggest stars with exceptional skills, but this time around it is Mou vs Pep. Despite d 8-0,dat bacer play last week,morinho will show gardiola he is d best coach jn d world.madrid 3 bacer 1. Real all the way! Hala Madrid! !, Hala Madrid!!! Barca are facing not only Real Madrid in top form, Cristiano Ronaldo in top form but also arguably the greatest coach of all time, Jose Mourinho. Real Madrid have not lost this season. They are a well oiled machine and the man driving that machine knows how to beat Barca, Jose Mourinho. He's done it before, he will do it again. The greatest defense on the plantet with Carvalho and Pepe will shut down Barca. Both teams are in great form, but Barca started the year rusty cause of the World Cup. So I say its gonna be a close one, but Barca has the edge of Camp Nou... VISCA BARCA....! Indeed a great match to delight, both teams have all they need to Win this game, but a team that reaches a bearly 1 season as a collective GREAT team could not win who holds the most amount of trophies in a season ever. Barcelona will win this game, not easily I bet we will have Alvez and Pique with at least yellos cards, Mascherano will show why he was hired and as usual Messi will Define the win but the shortest difference.. 1-0, 2-1 it will not be a bulky result for sure. Good luck to both but Visca Barca! Ihave always been a barcelona fan and i belive is going to be an intresting game. however, Barcelona will carry the day. i predict a 2-1 win in favor of Barcelona. Even both teams are now playing strong, Real has not encountered a true "strong" team this season (Milan was a joke of a team and could only tie with them) while Barcelona has already played with the top 4 teams in the leage (positions 3 to 6 in the Spanish league) so they seem to be in a better position. Hopefully, Ronaldo performs at his usual estra-low level when facing important games. I bet for a 3-0 for Barcelona. I think Real Madrid will play as Mourino had played against Barça all the times: pure defense and counter attacks... Real Madrid will not go to Barcelona to attack. Look for Real to win at Camp Nou on a 2-3. Mourinho will be angry to recieve 2 goals for the first time at Real Madrid. What is the over/under for how many dives Ronaldo takes? I dont know if this is going to be the greatest classico ever. It wil be a great match, but I doubt there will be many goals. Both teams have solid defence. Unless ronaldo can score a freekick or messi can beat the mourinho defence I think it will be a 1-1 draw. But lets hope not. Time, Date and Where to Watch would be appreciated! This game will not be the best game of all time,but it will be a good game to watch,both team will play a nice football but am more convince that Real madrid will win 2-1. This game will be very different than the ones before, the two teams are at this time playing the best football, specially Barca, but I have faith that Real will win this game at least by a difference of one goal. I bet for a 1-2. This is one of two games for the title as the rest of La Liga is so lame. Two great managers, two attacking teams, two great individual match winners, two sets of forwards scoring goals at will. Too bad they'll cancel each other out. 0-0 it ends. I believe that the over-rated Mourinho will approach the game with a defensive mindset. He has never faced Barca with an attacking formation at the Camp Nou, regardless of which team he is coaching. In terms of quality Madrid are all about effort & huff/puff, while Barca are a truly well-oiled machine. The one team is tended by a mechanic, the other by an artist! Barca to win it by 4-0 to the surprise of many, but not me. It will not be the greatest show of all time but it will be a game were either defense will be unable to stop either attack. The idea of who will win leaves me with even more suspense. same script casted by different author will be the case. 0-0 would be an interesting result. It´s going to be a very tough game . . . survival of the most tactical coach. I give it to Jose Mourinho’s team. The coach have the pedegree. Barcelona had done it before and it will still repeat itself again.my advice to Barca coach is for him to work on counter attack Jose used when he was with inter milan.all the best Barca fans 3-1agaist Real. Barca will win by 6-0.we'll win home and away for 3 cosecutive seasons b4 madrid còme back to their senses.we'v done for 2 seasons running n we shall for the 3rd time do it.Go Messi!Go Barca! We did it last year and we'll do it again. Obinna stop deceiving the world. Barca will loose this match regardless of whether they are a well oiled outfit or not. After Monday evening the whole world will know u as a liar. Barza 2- RM 1 !!!!! Will be a tough game. Let´s also hope for a good show and not a defensive show. i think this will be a very fantastic game of free scoring teams, i wish The Special One will not play defensive game but an attacking game. I think we will see who is between Messi and Ronaldo, i would love to see at least 4 goals and in favour of Barcalona. The truth about the game is that is going to be a very tactical game from both side,because,berca on their own side play at the center of the filed,way the madrid play from the side, so really is going to be very tactical. @ Josh- where do u live?? Barca has lost this season already and both loses was to a less talented team than real madrid, no doubt they have improve then but keys players are sturggling and they have a crucial CL game mid week as well against Panathinaikos which they have to win. Real on the other hand who hasn't lost a single game all season is riding high; Top of La Liga and only need a draw to qualified for the knock our stages of the CL. So they can rest key players against AJax who are struggling for form and goals and some might even say a sense of direction. Madrid will win despite d fact dat Barc is a good team.the worst case scenario will be a draw. Real to win 4-0. Quick counter attacks by Real's Portuguese, German, Argentinian front line will prove to be too much for Barca's Spanish back line. Hard to find a favourite. Mourinho has never won in the Camp Nou, and he will not win this year. Barca has been phenomenal but Madrid has been exceptional! With Mourinho in da boat i hope everything will be fine. Mourinho's mind play games alone will win this match. The 'SPECIAL ONE' in a special game for a special surprise. Mourinho, Ghana can't wait for your victory! It promises to be the greatest classic of all time. And I tip Ronaldo to carry the day and improve his effort to retain the crown he narrowly lost to Lionel Messi last season. I salute Messi. He is a great player no doubt. But when the challenge is against Christiano Ronaldo CR7, the chips certainly would fall. Its great to have quality players like them in the game today. I wish I have the privilege to watch Christiano Ronaldo LIVE! I am arguably his no. 1 fan in the world. I pray for him always. This will be one of the best classico of all time. surely the Mourinho and Ronaldo will be the most influential aspect of this game. at this moment Real madrid are too wildly dangerous in their attack and their unbeaten record in all competition will matter a lot in this game. it will be an impressive football match to watch and my gut feeling is Real Madrid is too good for Barcelona and one way or the other they will win this match. The el classico is truely the best classico in the world today , those of us who have followed bar vs mad matches live due to the kind of pressure and excitment this encounter use to generate know that it wort the tension inherent in it. bar have being fortunate in the last 2 years , but this time around , it will not be so, mourihno is a defensive coach playing a team like bar he will defend with his last blood, but bar with their short and quick passes will not penetrate mad defence so easily and that will make bar players cluster on mad area, but any loose ball , with the pace of ronaldo and ozil it will be dangerious for bar, bar 0 -- mad - 0 draw. Obinna, I will side with your analysis. Mourinho may be a good coach, but is certainly overrated. Madrid may have annihilated teams since the season began, but they are yet to play a worthy opponent. Besides, there is the fear factor, what with Madrid having lost to Barca four times out of their last four encounters. While it may not necssarily be the best El-clasico yet, it still promises to be an entertaining game. My predictions? I'll up your score Obinhna, 5-0 in the favor of Barcelona. 2-0 Barça is the best team in the world!!!!!!!!!!!!!!!!!!!!!! Barca 3-1. Lineker 2, Cruyff 1 and a Hugo Sanchez overkick for Los Merengues. this may be one of the best classicos because real are with the special one opperation jose and as well both teams are in their top performance currently and as well there are best players ronaldo and messi on both sides and 1-1 will be the final result. Hello Mr Pinto & everybody else.. The el classico encounters have always been huge attractions and it has kept its reputation intact by consistently throwing up brilliant contests over the years. Im a huge Barcelona fan but this time around, I feel Real Madrid would win due to the all-important Mourinho factor. The guy is terriffic, may not be liked by many, but his triumphs are definitely envious. He has got amazing footballing acumen. It would be interesting to see how Mourinho stifles Messi this time, he has always succeeded in nullifying the Messi element. This is football at its best, thats what the Primera Liga is all about – flair and goals galore. One of my most memorable el classico moments has to be maestro Ronaldinho's brilliant two-goal display at the Bernabeu and the standing ovation that he received from the rival fans. Every season the stakes are much higher with the el classico so I wouldnt bill this clash as the best ever. Hoping for a Barcelona win but I go for Madrid 3-1. Let us enjoy the game and applaud whoever wins. It is going to be a ripper!! Seguro que ganamos a estos merengues. Obviously pedro, u'll agree with me. CR7 & messi r both on top form. But CR7 rarely performs against big opponents & that wil b the difference. I see barca nicking it 1-0. Good luck to both teams & hope they gve us a good game. Its gonna be a wonderful match and that's all I care about! Good luck to both teams!!! I am of the greatest conversion that Barcelona, the best and biggest club team in the world will on Monday defeat Real Madrid in a 2-0 defeat at the camp Nou. The defeat to Madrid will cause Jose to resign his post as head coach. I think it will be a very technical match! The Barca team have got real talented players, while real madrid got great players too. It might boil down to a game of coaches – we know the special one will prevail! I have wached in T.V the American advertising about this match. It's horrific !!! Barcelona is in Catalonia and we don't feel good watching a girl dancing flamenco, this is not our culture. I think the clash between Real Madrid and Barcelona is going to be the most exciting game ever! It can go either way. Mourinho has many new players, that could be either to his advantage or not. They might be bringing some new tactics into the game or perhaps playing with newbies will be out of their element. Barcelona are quick and do play as one and Messi has been at his best ever! If Mourinho manages to break their strong defense then Barcelona might have a big problem there. Will this be the best ever ? But for sure it will be the match of the best both coaches ever. These two guys are really the top of the top atm. I see Real winning – sadly i have to admit – cauz JM is the better one. His main skill is that he is more flexible in his tactics than anybody else in this range. Remember the CL Final against Bayern. Both had a system – van Gaal as well as JM. But JM was focused on the win. VG was focused on his system. So even when bayern had more ball possion, they didnt deserve to win. It's going to be an interesting game. The battle lines are however not just drawn btn Mou/Pep or Ronaldo/Messi or Real/Barca. It's drawn on diff lines btn diff opponents which will even make it a better game. Messi will be looking at paying the Germans (Oezil and Khedira) back for what they did to him (argentina) at the world cup. Puyol and Pique will do their best against CR7 on the backdrop that CR7 can now do damage to them with reflections from the Spain/Portugal game. Then comes a Mascherano/Iniesta vrs Xabi Alonso war in midfield. The are really lots of individual battles in this game that space will not allow me elaborate. All in all, this will be the toughest, physical, tactical, skillful and Most watched El Classico ever! Most people say barca will wins but this is not a game one can easily predict but i think it will be a close context. it may end goalless. none of them want to lose this game, so they will play with cautious. Give it to Barca at three goals to one. Two to one at the end of the first half, and a goal topping in the second half by Pedro. Finito. See you at Nou Camp. I still believe Barca is stronger! They get the ball and they hold it and that´s why they are so dominant. They don´t make mistakes. They know Mourinho. Last year from four games against Mourinho they won three and lost one, but they have lost the one because they had to go by bus to travel to Milano and they were tired and not concentrated enough for this level. I don´t think that Real is stronger than Inter last year. And at the WM Özil&Co had no chance against half-Barcelona-Spain as Portugal. I think they know how to stop Ronaldo and Özil and they know enough about Mourinhos tactic. Humiliating defeat for "The Special One" Mourinho and a Real Madrid team that claimed to be in the best form possible. 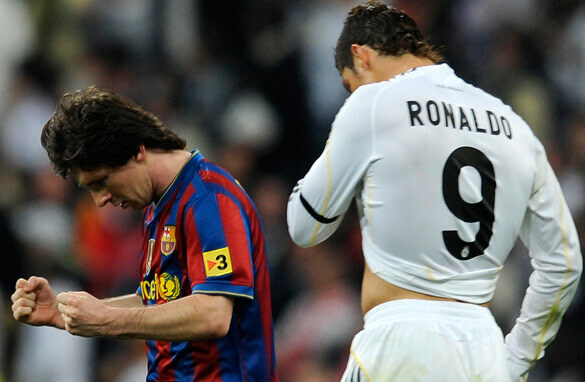 BUT I still don't think this was the best classico ever. MAY 2 2009, SANTIAGO BERNABEU 2-6 NEVER FORGET. It been so long that i can,t remember when I watched a team play football like this.Barcelona is undoubtedly the best football team in the world to put 5 goals past a Real Madrid that has not lost a single game this season.I have always said it that Ronaldo is not that good.I will love to have this match recorded and added to my football classic records. This is a great shame for Real. Jose squad was totally confused against BAR as usual on last night. I do not know the reason but its reality. i thought that madrid would win.But I am not lucky. I thought Madrid would win but i am not lucky. "I believe we will see an open, entertaining affair, with two teams going right at each other’s throats." wrote Pedro Pinto before the game, and he was 98% right, the Real Madrid defence was wide open and Barcelona entertained us with 5 well taken goals. The 2% Pinto got wrong concerned the "going right at each other’s throats" part, as Barca went for the throat while Madrid went for the shins, mainly of Lionel Messi. There's a long way to go yet, but great to see Mourinho and Ronaldo eating crow. The final score. A 5-0 verdict to Barcelona ! I don't know if this could be called as the greatest of all clasicos.